DIY oil painting paint by numbers kit for adults beginner bring fantastic painting experience. Enjoy the funny project with highly concentrated, you will get much more compliments when get amazing results ! --Paint by color numbers, finish one by one. --Wash the brush when you finish every day or change colors. --Follow the top to bottom, from left to right paint the color. --You can decide the drawing turn according to your personal favor or in turns of the numbers. --We provide enough paint to use, do not waste in the case of paint shortage. --The figures on the canvas may not be completely covered, hope you do not mind. --Import professional oil canvas, good density, easy to color. --Healthy digital pigments, high color reproduction, bright colors. --Paint can be directly colored, no need to add water. --Paint coverage is strong, the painting process if the error, you can cover the correct color. --The paint is easy to dry, when you don't use, cover the lid, If the paint is too dry, add 1-2 drops of water to stir evenly, remember don't too much. --The paint box corresponds to the number on the canvas, and the unmarked pigments correspond to the shaded parts of the canvas. --Easy to clean, good water absorption. --Wash the brush cleanly when you change to another color or stop paint. --For the large part, you can use the larger brush to paint, and for the small part, you can use the smaller brush to paint. 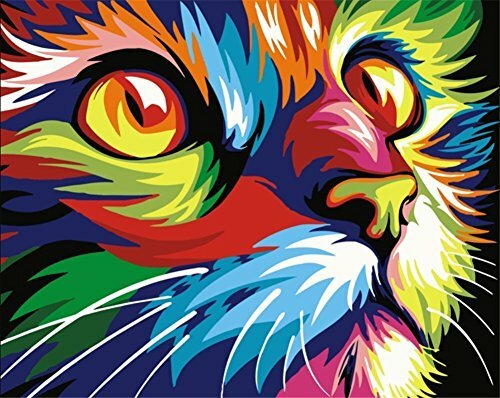 Product Feature: Paint by number for adults painting on canvas frameless, charming cat diy oil painting. How to Do: You need match the numbers of the paint and the figures on the canvas to fill in the paint. Package Includes: 1 pcs pre-printed textured art canvas (without framed), 1 set acrylic paints, 1 set brushes(include 3pcs). If you have any questions about this product by Komking, contact us by completing and submitting the form below. If you are looking for a specif part number, please include it with your message.